Junior Ilkley Harriers is the junior section of Ilkley Harriers AC and provides training, racing, and social activities for young athletes. The Club colours are red and green. Please send any enquiries to Shirley (email ). There are opportunities for juniors to train on the fells and compete in both FRA and BOFRA events. 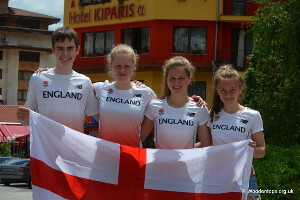 In 2015 Ruaridh Mon Williams, Sarah Pickering, Jemima Elgood and Lucy Haines were selected to represent England in the World Mountain Running Championships in Hungary. They followed in the footsteps of Georgia Malir (2011) and Lucy Williamson (2013) and since then other juniors have gained their England vests - Euan Brennan and Bethan Morley (2017) and Bernadette Raven (2018). 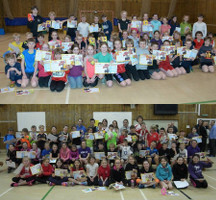 A good number of the juniors we coach start in the Sportshall Athletics programme. We encourage attendance at the regional SHA trials and over the years a number of our juniors have represented West Yorkshire, North Yorkshire or Leeds at U11, U13 or U15 level. Some juniors solely train and compete in the endurance programme. 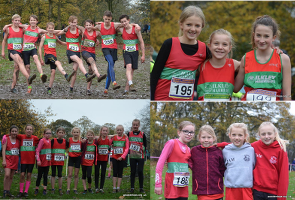 Ilkley caters for cross-country runners of all ages and abilities from organising the local Wharfedale Primary Schools XC League to competing at club level at the PECO and West Yorkshire Leagues and Yorkshire, Northern and National Championship events. All our juniors, Year 10 and older have the opportunity to help at coaching sessions and gain nationally recognised awards. Year 9's are able to help at sessions just to be helpful! 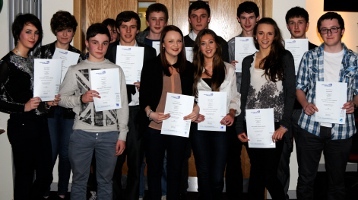 The photo shows our very first set of 13 junior Leaders who were presented with their Level 2 Award in Sports Leadership at the Ilkley Harriers Presentation Evening, January 2012. We encourage our athletes to continue doing all activities as long as possible and not to specialise. SHA provides a great all round starting point for the Track & Field programme. 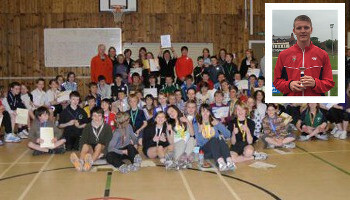 Harry Maslen has been a great ambassador to our athletics programme over the years. He is in the group photo as a youngster gaining his Gold Level 2 SHA Decathlon award and inset in 2015 competing for England and gaining a bronze medal in the U20 Decathlon Home International Championships at Hexham. ... to the 8 juniors who ran at the first FRA Champs event at Clough Head and to the 8 who ran in the first Bunny run of the series. Report and results from Kim. Updated JIH fell League tables. See Training and Coaching for more details. Open to everyone - all abilities & newcomers. Please note we have waiting lists on both the Monday and Thursday Athletics sessions and are unlikely to bring any newcomers into the programme until September 2020. The Wednesday running session is also near capacity. Please contact Shirley if you are interested in any of these sessions and she will put you on the waiting list or put you in contact with the Wednesday running lead coaches. Monday: Outdoor Athletics, Ghyll Royd School. Session 1: 5.30 to 6.45 for Years 2-4; Session 2: 7pm to 8.15 for Years 5-8. Starts 13th May. Wednesday: Speed endurance, Yrs 5- 11, IGS field, 5.30 to 6.30. Starts 24th April. Thursday: Outdoor Athletics, Ghyll Royd School. Session 1: 5.30 to 6.45 for Years 2-5; Session 2: 7pm to 8.15 for Years 6&7. Starts 9th May. For those juniors who compete for Ilkley ONLY or by invitation (Years 7 to 13). We expect a high level of commitment, motivation, self discipline and behaviour and the maturity to work hard in smaller coaching groups with specific coaches. All juniors must want to continue with athletics and to train to compete. Over the next 12 months as we decrease the number in our general programme we we will be increasing the number of sessions and athletes in our specific sessions. Your commitment to us is to compete for the junior Harriers. Contact Shirley if you are interested in doing any of these training sessions. Monday: Fell Running Hill Training, Ilkley Moor, 6pm to 7pm. Sessions going through. Sally Malir runs a 'by invitation only' small mentored group of Year 9 and older - sessions to be organised with individuals. The Google calender gives details of local races for Fell Running, XC, Track & Field Athletics and Sportshall Athletics events that juniors can compete in. Competition is important so we encourage parents to support their children's interest by attending some of these events. Saturday: Parkruns at various local venues, Skipton, Harrogate, Leeds & Bradford.